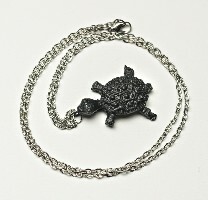 03097B Necklace, Turtle on chain (coal) [03097B] - $8.95 : Red Bird Mission Crafts, Hand crafted art. This small turtle size is approximate 1.75" x 1.25". It is cast from coal with a resin binder, put into a handmade mold, has a black lacquer finish and is on an about a 21" chain.